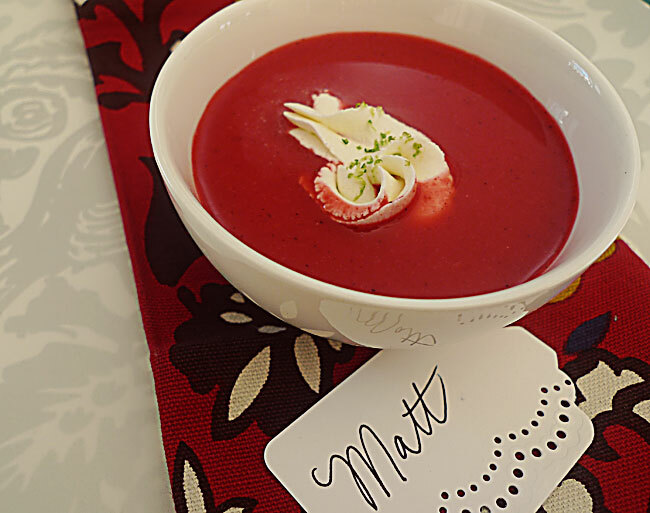 This soup is an elegant starter or refreshing dessert. It's simple to make and can be done the day before. Make it once, you'll love it forever. In a blender, puree raspberries and water . Transfer to a large saucepan and add the cran-raspberry juice, sugar, cinnamon and cloves. Bring just to a boil over medium heat. Remove from the heat; pour through a sieve to remove the cloves and most of the seeds, allow to cool (depending on your sieve, the straining may take a little while, I leave mine and let it drip through). Once cooled, whisk in lemon juice, yogurt, and sour cream. Refrigerate until ready to serve. To serve, pour into small bowls and top with a dollop of whipped cream. Yield: 6 servings. *original recipe many years ago from Taste of Home, I've adapted slightly. Note: If you have any leftovers, it makes the most amazing raspberry milkshakes when blended with a couple scoops of vanilla ice cream. Seriously, I almost passed out it was so good.